When we finished our tour of the Ring of Kerry, our group decided to jaunt our way through the national park at Killarney. Not jogging. Jogging would have killed me. No, we rode a jaunting carriage pulled by a very hairy horse. My friend the school teacher who arranged for my son Josh and I to be part of the tour said she hoped this went better than the gondola ride around Venice on one of her student tours a few years ago. The gondolier didn’t sing, didn’t talk about the sights they were passing and didn’t flirt with the women on the boat. What kind of an Italian was he? Our Irish carriage driver invited my friend to sit up front with him and included her in all his comments about the foliage, mountains, lakes and history of old Killarney. 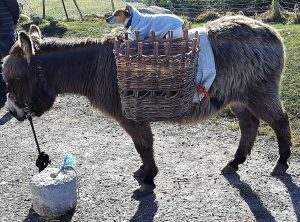 I think she came away liking Irish jaunting drivers better than Italian gondoliers. 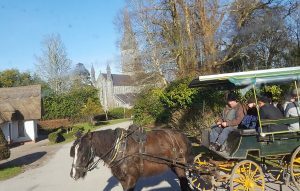 The jaunting carriage tour began in downtown Killarney, turned a corner and entered the national park. In my first photo, you can see a touring carriage with Killarney cathedral in the background. I know the jaunting driver looks like me, but I couldn’t be taking pictures of one carriage if I were in another one. What this picture does prove is that I have a lot of Irish relatives in my past. By the way, the cathedral was very impressive. We could see it many miles away before our tour bus even got to the city limits. Many residents of Killarney don’t share the tourists’ appreciation, though. The Roman Catholic Church built the cathedral in the early part of the nineteenth century when Ireland was going through the Potato Famine. The church thought the big cathedral would give the residents inspiration. As I was told by more than one local, they would have preferred a good meal instead. Our gregarious driver told us they had just had a late snow a few days before we arrived. In the distance we could see the mountaintops still covered in snow. He pointed out the little flower bulb sprouts were peeking through the ground and in a few weeks the entire park would be resplendent in color. Several trees had gone down during the storm and they were laying around wondering if they would be eventually cut and carried out or be left to rot and become wonderful mulch. 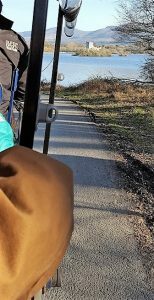 It was still cold when our carriage horse tried its best to avoid the washed-out portions of the road. The sun shone and the wind had disappeared with the snow, so the weather was really quite pleasant, as long as you were dressed in at least three layers of clothes, wore a woolen cap and gloves. Ducks waddling alongside the road didn’t seem mind the crisp air. Neither did the Killarney natives who jogged past us. The second picture shows my elbow which was properly attired in a heavy coat. At several points we saw crumbled stone ruins hiding among the trees and when we turned a bend in the road we saw an old castle glistening in the sun’s rays as it sat on an island of a long, wide lake. I knew the tour was coming to an end because in the distance I saw modern condominium communities on the outskirts of Killarney. You can’t get away from the modern world no matter where you go. That is not an entirely bad thing, however. When we returned to the tour station, we embarked, handed our entertaining guide a tip and found only a few steps away a toilet facility. We climbed onto our bus and on our way to our quaint Irish hotel we passed several outlet malls featuring the latest of everything at the lowest prices. The hotel itself was lovely but challenging. It was several years old, and the owners had added rooms and extra floors wherever it was convenient. My son Josh and I felt we needed a map to get to our beds. But at least we didn’t have to sleep in a desolate castle destroyed by Oliver Cromwell. 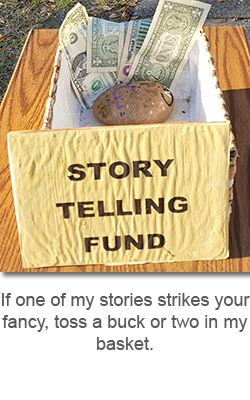 This entry was posted in Opinion, Stories and tagged family, opinion, storytelling, travel on April 24, 2018 by jerrycowling. 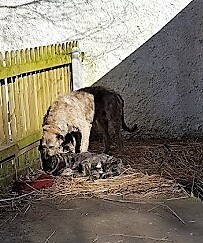 But the best part of the village was the enclosure where they kept the Irish wolfhounds. You know, they are the size of little ponies and are best to guard all the other livestock who lived there. When I first walked up they were up on their hind feet, staring you in the eye and accepting all the pats and scratches behind the ears they could get. By the time I got my son over to take pictures on his phone, it seems the hounds decided it was break time and they went to the far side of their pen for a mid-morning nap. No amount of cooing, kissy sounds, whistles and sweet entreaties could convince them to come back. No way. Next round of cuddling at the fence began at noon—or whenever—and fans and groupies could come back then. My son got a picture of them on break any way. We had not been on the road again for anytime at all when some of the teen-aged girls in the back started going “aww”. The tour bus driver was a real pro. He knew when people starting oohing over animals on the side of the road he made an unscheduled stop. All the cynical, blasé teens tumbled out of the bus to pet the dog and donkey, who looked bored but used to getting attention from tourists. Even us old people thought they were cute. We got out of the bus and took pictures. A gentleman about my age—meaning he was old, really old—sat on the side with a contented smile and his cap on the ground filled with coins. Several people, of all ages, said the same thing coming back to their seats. They spoke too soon. The next scheduled stop was only a few miles down the road, a statue of the Virgin Mary on a promontory overlooking an inlet of waves crashing against giant boulders. Scores of birds covered juts of land and islands sunning themselves. This particular statue of Mary was not known for having tears in her eyes, but for actually being observed to move. None of this, however, meant a thing to the people on our bus. As soon as we pulled into the parking lot someone screamed out. 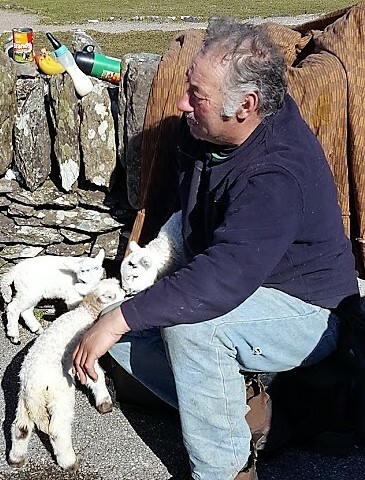 Sure enough, on the outside of the wrought iron fence guarding the statue of the Virgin Mary, was another old man with three or four tiny lambs, not more than a week or two old, scampering around, crawling up into laps and licking as many faces as they could. The only problem was that I didn’t think everyone was going to get to hold a lamb before we were called back to the bus. Being the oldest person there, I resisted knocking children out of the way so I could hold a baby lamb—even though, I must point out in journalistic accuracy, I have never gotten to hold a baby lamb ever in my life. To show I held no misgivings about the turn of events, I did throw a coin in the old man’s hat. This entry was posted in Opinion and tagged England, family, Ireland, travel, Wales on April 13, 2018 by jerrycowling.